The Really Good Stuff, Inc. was founded in 2001. Since then, the RGS brand of fireworks has gained popularity throughout the country..
RGS Brand Fireworks was developed to consistently provide high quality products year to year. 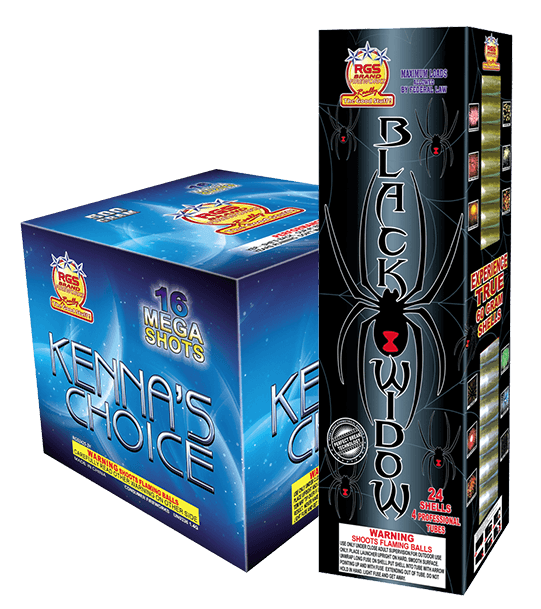 Through the use of Brilliant colors and unique effects, RGS Brand Fireworks has carved a unique niche in every market that it is sold. From our very first RGS item developed (Kenna’s Choice) to the infamous Black Widow Artillery Shells, we take pride in the quality and performance of every item with a RGS logo on it. Yearly trips directly to our partner factories in China ensure this quality. We hold great personal relationship with our team overseas and communicate with them on a daily basis. We test thousands of items throughout the year to ensure the RGS brand maintains the reputation it has built and that our partner factories produce products worthy of the RGS Brand. Contact RGS Brand Fireworks for more information. RGS Brand Fireworks is sold only to authorized distributors throughout the country. Distributorships are limited.